Enjoy French-influenced American dishes from an experienced chef at this Shaw neighborhood restaurant. 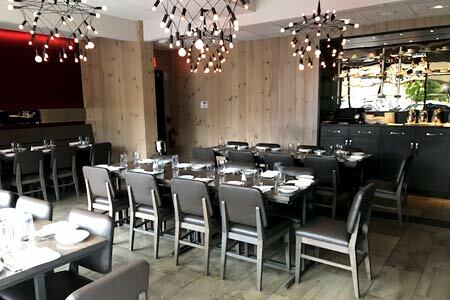 About the restaurant & chef: No wonder this Shaw neighborhood restaurant gets such buzz: its chef is Cedric Maupillier, who worked for Michel Richard and then cooked at another spot in Adams Morgan, called Mintwood Place. His skills are evident in his menu and in the fact that the space, with its separate dining areas and bar setting, fills up fast. Dislikes: Acoustics make the venue noisy. Food & Drinks: The regular dinner menu features a stream of French-influenced American dishes, as in the confit duck gizzards or leeks Dijonnaise appetizers; and the bacon raclette cheeseburger and the bouillabaisse as main courses --- though a savvy eater may call it quits there, as portions are generous. However, that would mean missing a dessert, the floating island or hot sticky toffee pudding, for example. Among tempting cocktails is French 125, and the beer and wine choices are ample indeed. But one of the best ways to launch weekend activities is with a Convivial brunch. Plenty of libations are on hand to complement the kitchen’s fresh plum muesli, the whitefish salad, quiche Lorraine or chicken burger. Pair the cinnamon bun, delivered hot and dripping with sugary topping, and an entrée like the fried chicken and waffle: crunchy chicken skin covers the boneless chicken atop a half waffle, and the combination is delicious. Sides, like Nueske’s bacon or grilled multigrain bread, can fill out the meal. Staff is helpful and courteous.